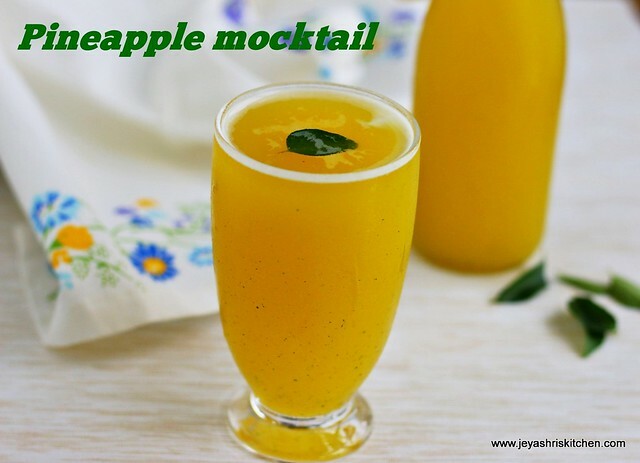 Pineapple mocktail made with pineapple, curry leaves, ginger and tender coconut water. I ahve already posted a pineapple orange juice combo and a grape orange juice with ginger. Last week when Raks visited our house casually, i made a Pineapple juice for her by adding freshly squeezed orange juice to this. I made it for everyone at home and it was a super hit at home. So i thought of making this as a post for jeyashris kitchen and took the video of pineapple mocktail yesterday. Thsi time i tried with tender coconut water and replaced mint leaves with curry leaves. I thoroughly enjoyed a tall glass of pineapple elaneer mocktail after shooting the video and the clicks. Stay hydrated this summer and enjoy this summer drink. In mixie|blender add the pineapple chunks, ginger,curry leaves and sugar. Blend this well into a paste adding 1/2 cup of water. Using a sieve, filter the juice. Add the chilled coconut water to the pineapple juice mixier. Garnish with a curry leaf. Instead of elaneer|coconut water you can add freshly squeezed orange juice. If using orange juice add 1to 2 cups of juice and add water too. 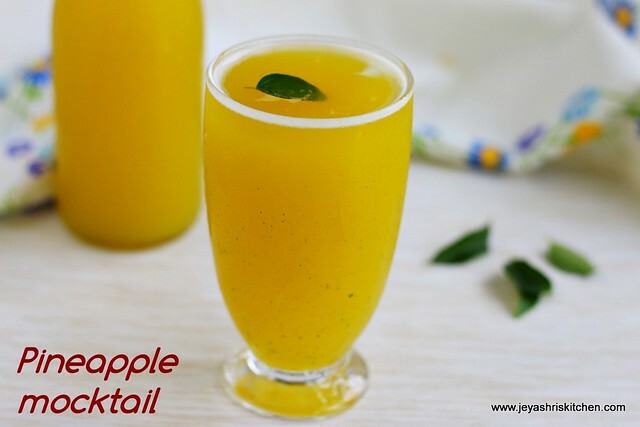 You can add finely chopped coconut bits to this juice to make it more interesting. some freshly squeezed lemon juice can also be added. Add elaneer just before serving the juice, else it won't taste nice. Instead of curry leaves you can add mint leaves. Wow.. mocktail with curry leaves must be so good. Yes it was super yum.